There are a number of aspects that needs to be taken into consideration when testing a borehole. According to Prof van Tonder at the Institute for Groundwater Studies (Free State University) there are two important rules that needs to be kept in mind when determining the sustainable yield I.e. 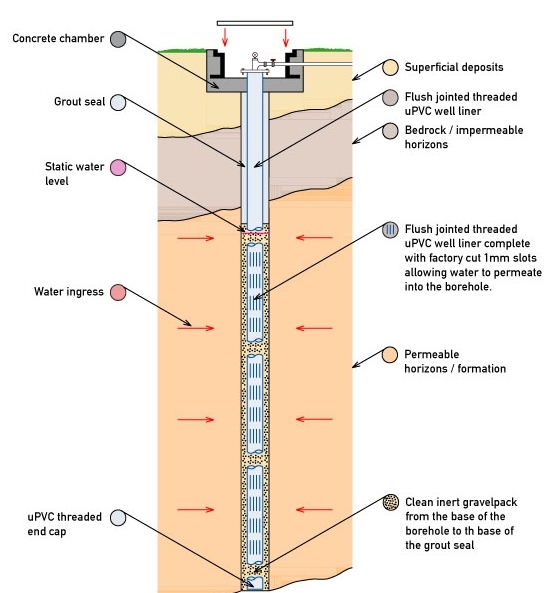 : The total abstraction from a borehole should be less than the natural groundwater recharge, and secondly, a borehole should be pumped in such a manner that the water level never reaches the position of the main water strike (normally associated with a fracture). Should this happen the yield will inevitably be affected and the borehole would eventually dry up. What is the rest water level before the start of the test? How does the water level change over time once pumping has started? How long does it take for the water level to recover after the pump has been stopped to recover to the original level – or how far does the water level recover after the same amount of time allowed as for pumping – leaving a residual drawdown? 2. To establish aquifer potential. To assess the hydraulic characteristics of the aquifer. An important aspect of a borehole yield test is the monitoring of the water quality as pumped from the borehole. A water sample should be taken at the start of the test as well as at the end of the test for full chemical analysis, while the electrical conductivity and temperature is monitored with the water level for the duration of the test. This information assists in understanding the aquifer behaviour e.g. are we abstracting some of the older water from deeper formations or does the aquifer yield sufficient fresh water quantities? The determination of a sustainable yield will normally take this information into account. The water quality is also of importance to determine whether it is suitable for domestic, irrigation or industrial purposes. An example of this importance for domestic purposes is the nitrate content of water. According to South African Standards the maximum allowable limit is 10mg/l. Too much Nitrate has a major impact on infants less than 6 months old and leads to a condition called methemoglobinemia (blue-baby syndrome) and could be fateful.